The journal “Science” just published the first article on the findings on the dwarf planet Pluto and its moons made thanks to NASA’s New Horizons spacecraft July 14, 2015 flyby. Alan Stern of the Southwest Research Institute (SwRI), the principal investigator of the New Horizons mission, is also the first of a long series of authors of this study that first of all stresses the extraordinary geological and morphological variety of Pluto’s system. This article describe the first results of the exploration of Pluto and its moons, which for the most part are those reported by NASA in several articles published after the New Horizons space probe’s flyby. That event turned out to be even more exciting than you might have imagined thanks to the variety found on the surface of the dwarf planet and Charon, its largest moon. 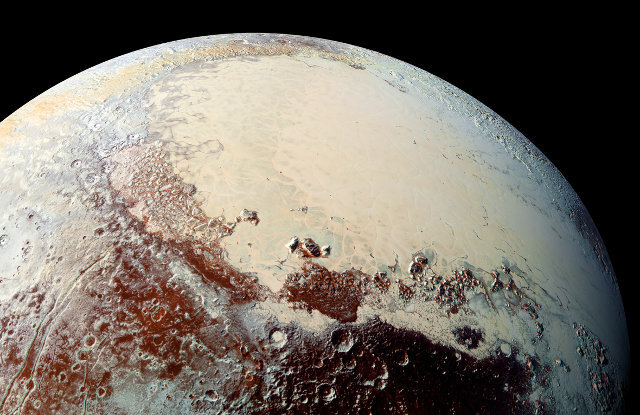 Since the first photographs, it was clear that Pluto had been geologically active until recently and perhaps still is. It’s an unexpected discovery considered this dwarf planet’s distance from the Sun and size. Until the New Horizons space probe’s flyby, scientists tended to think that Pluto was similar to Triton, a moon of Neptune that is probably a Kuiper Belt object captured by the planet. The reality proved to be more complex. About moons, the New Horizons space probe allowed to measure two of Pluto’s smaller moons: the size of Nix are approximately 54 × 41 × 36 km (about 33.5 x 25.5 x 22 miles), those of Hydra are of 43 x 33 km (26.7 x 20.5 miles). The data collected indicate that they spin very rapidly and that Pluto has no other moons besides the ones already known. The findings on the diversity and geological activity of Pluto and Charon led researchers to ask new questions about the geology of the other dwarf planets. Eris, Makemake and Haumea could also have a complex and intriguing history. Unfortunately they are farther from the Sun than Pluto, making sending a space probe even more difficult. New Horizons took about nine and a half years to reach Pluto only for a flyby. At the moment, Makemake and Haumea are little more distant from the Sun but Eris is about three times farther from the Sun than Pluto. We don’t know when it will be possible to have a close look at these dwarf planets but after the experience that actually has just begun with Pluto I think that they’ll give us more surprises.